Where do I begin... Right at the top? Sure lets do that. Azhar Ali averages 38 at a strike rate of 75; Ahmed Shehzad averages 33 at a strike rate of 72. Decent numbers if we were in the 90s. We are in 2017 damn it! Compare Azhar and Shehzad to other international openers their lack of skill, ineptness, pathetic approach, and inability in the ODI format becomes apparent. 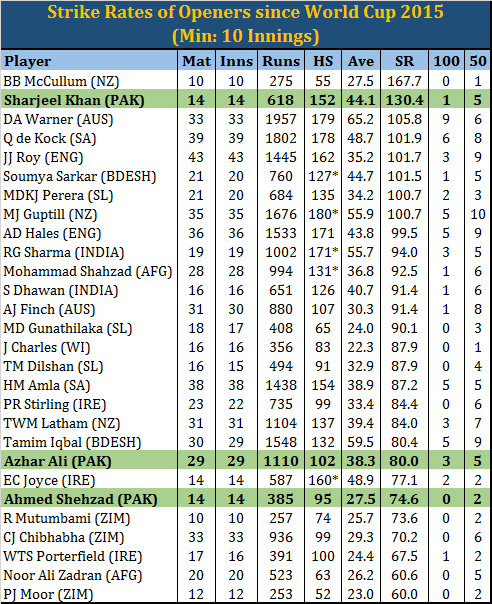 Since the ICC World Cup 2015, Azhar and Shehzad are at the bottom of the pile in terms of strike rates of openers. The only openers below them are a few from Zimbabwe, a couple from Ireland, and one from Afghanistan. And then we wonder why we are languishing at number 8. We had one Sharjeel Khan. A world class modern day ODI opener as the numbers in the above table suggest. Unfortunately we lost him to the menace that has been plaguing Pakistan cricket since the 90s. 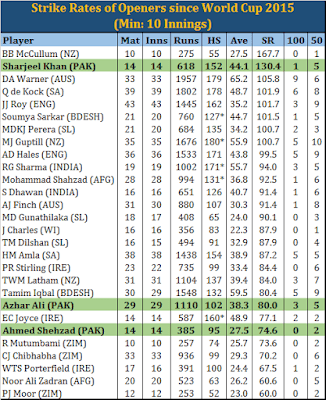 The question really is, why do we keep persisting with Azhar and Shehzad at the top of the order? It is clear, by all the rubbish that Azhar, Sarfraz, and Micky Arthur have been talking, that Pakistan want to play modern day ODI cricket. That they want to change the way they play ODI cricket. When all the talk is there, where is the thought? Why don't they then back the players who have the ability to play this brand of ODI cricket? And I will not for one second buy the argument that there is no one in Pakistan with this sort of ability. Fakhar Zaman is in the ODI squad for the Champions Trophy. He has been part of the ODI squad for a few series now. Fakhar Zaman had quite an amazing PSL. Fakhar Zaman has an average of 50.46 and a strike rate of 94.15 in 48 List A matches. Fakhar Zaman is sitting warming the bench in the UK, while Azhar and Shehzad show the world how pathetic they are. If you want to change your brand of cricket, you need to change your personnel, starting with inducting Fakhar Zaman at the top of the order. Sarfraz is a skillful batsman. He is always busy at the crease, keeps the scoreboard ticking, and bats according to the demands of the modern game. He is a good ODI record too averaging 35 at a strike rate of 89 - just the kind of batsman Pakistan needs. But why he is batting at number 6 is beyond comprehension. Sarfraz has been used as an opener for Pakistan. He has opened in List A cricket for his department, PIA. He has batted at 4 and 5 as well under Azhar Ali. And he has been effective in all these positions. His record while batting in the top 5 is remarkable and in stark contract to his record when he bats at 6 or lower. In fact, when batting at in the top 5, he averages double of what he averages when batting lower. Both his ODI centuries and 5 out of his 6 ODI fifties have come when he bats in the top 5. Yet as captain he is batting at number 6. Pakistan can do a lot more with Sarfraz a bit higher in the order. They will score more than they are doing at present for sure. This one is really beyond me. That one spell to Shane Watson two years ago and a 5-fer at Mohali 6 years ago will forever haunt us. Poor Shane Watson must also be wondering how he made it possible for a bowler like Wahab to dominate him. It does not take a genius to realize that Wahab should not be playing ODIs. He has averaged 47 with the ball in ODIs since the World Cup 2015 and still he continues playing for Pakistan. I can bet you that he would have played again in the Champions Trophy had he not been ruled out due to injury. A relatively unknown quantity till his blitzkrieg against Bangladesh in the Champions Trophy warm up match, why he was left on the bench against India is also a mystery. Maybe his bowling is not up to the mark, but his numbers suggest otherwise - List A average of 25, economy of 5.3 and strike rate of 28. How can someone with those numbers with the ball not be considered as a bowler who can bat a bit? Pakistan desperately requires some hard hitting batsmen in their line up and Fahim Ashraf is ideal for this role. Even if he does not bowl well, we seem to have enough back up in Shoaib Malik and Mohammad Hafeez. Why do we only talk big and not take action to back that talk? 1. Drop Ahmed Shehzad. Bring in Fakhar Zaman to open. 2. Sarfraz to bat at number 4. Followed by Hafeez and Malik. 3. Faheem Ashraf to play instead of Wahab. 4. Get more overs out of Hafeez and Malik. You know, it may not yield the right results immediately, but at least it will demonstrate intent to actually change the way Pakistan is playing its ODI cricket these days. Y not play Faheem in place of Imad, he has not been performing in batting at all, bring in Junaid and Faheem both in place of wahab n imad and Fakhar in place of Ahmed.